It’s not often that you’ll see this, so I had to make sure that I shared! Y’all I’m putting my OWN family on the blog today! 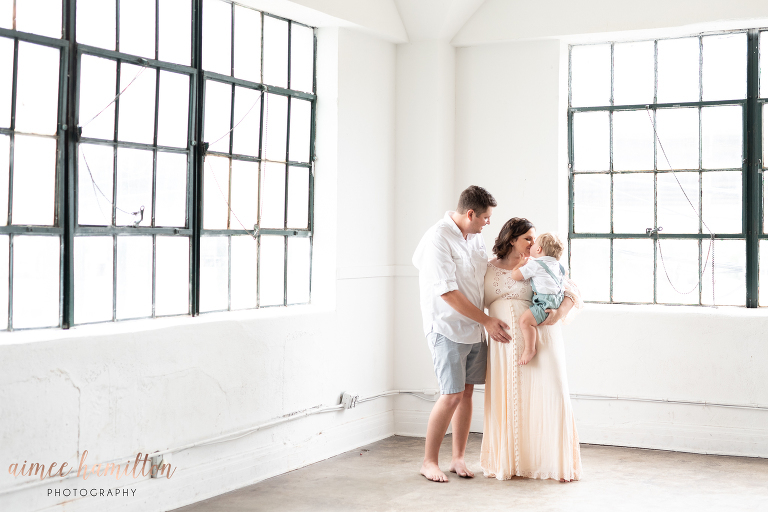 I am truly so excited to share our maternity portraits at The Studio HTX! When I was pregnant with our first baby, I booked a maternity and newborn package. It was just my luck that it SNOWED in March on the day our portraits were scheduled. I was so sad, but secretly, a little relieved. I had crazy high blood pressure with that pregnancy and the swelling was intense! I didn’t feel my best, so when our photographer offered to shoot a Fresh 48 instead of rescheduling, I took it! Fast forward to the second baby, and I didn’t even schedule maternity portraits. I don’t really have a good reason for why, I just never did! This time, I made it a point to get it all lined up. We had a photographer, hair and make-up artist and a beautiful beach location planned. And then, it rained on two different days that we had scheduled! Then, The Studio HTX came riding in like a knight in shining white armor to save the day! Y’all. I couldn’t have loved this location more! The lighting and industrial look were everything I ever wanted! Y’all. This wasn’t my first choice, but it should have been! I had a vision for my own maternity portraits, but I didn’t want a location with a lot greens (like fields and trees). The beach at sunset would be gorgeous, but truthfully, I just wanted something unique. I was looking for something that “everyone” doesn’t have! I’m excited to say that the studio look is basically the things my photographer dreams are made of! The Studio HTX is a commercial photography studio minutes from downtown and walking distance to Minute Maid Stadium. The studio is painted all white with contrasting black windows and concrete floors. Two full walls of window provide beautiful lighting that completely fill the studio. I truly enjoyed shooting my own session here and can’t wait to come back with clients next month!